You are here:Home>Texas Car Accident Lawyer>How Much Money Can I Recover After a Car Accident? In addition to causing physical suffering, a car accident can create profound financial pressures. Beset by unexpected expenses ranging from hospital bills to car replacement costs-and unable to work because of the crash-you need help. In a perfect world, you would be compensated for present and future damages. But realistically, how much can you expect to get? As a Texas driver, your damages could be reduced significantly if the court deems you partially at fault for the accident. If the court concludes that you were mostly at fault (51% or more), you generally cannot obtain damages from the other driver. The Rocky Mountain Insurance Information Association reported an average Texas car accident settlement of $15,440 in 2013. However, many victims receive more, particularly if they suffer severe injuries that necessitate ongoing care. Aggressive representation can improve your chances of achieving damages that exceed the state average. Damages vary considerably from one case to the next, and no one formula can accurately estimate your success in recovering these funds. Consult with a trusted McKinney car accident attorney to estimate your potential for recovery based on the circumstances of your accident and local legislation. Looking to maximize your chances of recovery following a car accident in McKinney? 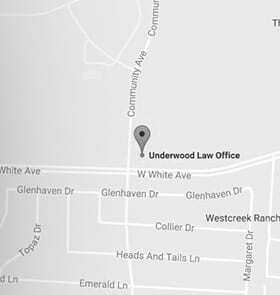 Contact a Texas Car Accident Lawyer: The Underwood Law Office can help. Call 469-573-4558 today to learn more.